Roger Federer has claimed a historic landmark in his career after he won his 100th title with a 6-4, 6-4 victory against Stefanos Tsitsipas at the Dubai Tennis Championships on Saturday. "I don't know if Stefanos was born when I won my first title", Federer joked. 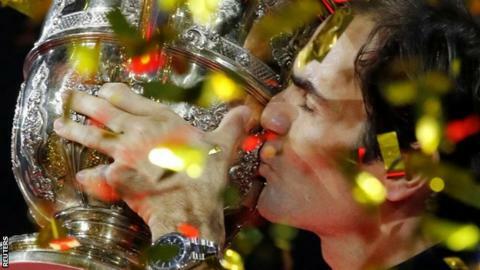 A single break in each set backed up by a dominant performance on his own serve was enough for Federer to claim an eighth Dubai title. "Welcome to the "Triple Digit" tournament victory club", Connors said in a Twitter post to Federer, "I've been a bit lonely - glad to have the company!" Tsitsipas won the Open 13 in Marseille last week for the second title of his career. It all began for Federer with his first title coming in Milan in January 2001, where at an ATP event worth 175 ranking points he prevailed over Frenchman Julien Boutter in the final. It was a treat to play Pete Sampras and Andre Agassi. "It's been a hard week for me, tough opponents throughout but credit to Stefanos as well, he played a great tournament". Three winners pushed the Swiss 40-0 and he sealed the deal when Stefanos netted a forehand, starting a massive celebration of what has been one of the most significant titles of his glorious career so far. "You've created history in tennis and keep doing what you're doing".